The set includes an aluminium storage case for transport. The Bi-metal hole saw's fast cutting power lies behind its HSS (hi-speed steel) manufactured teeth. The teeth have been set to a variable pitch to improve harmonic vibration and to have a better chip clearance. The Bi-metal hole saws are primarily used by electricians, plumbers, machinists and carpenters. Low vibration and even cut due to the variable pitched teeth. Strong electron beam welded cup design with a tough alloy body for added durability. Knock out hole for plug removal. Long life - when used properly within the correct rpm and using a lubricant when cutting into metals. Use paraffin or beeswax when cutting into aluminium. Use CT-90 or a general-purpose lubricating oil when cutting into steel. A portable drill or stationary drill with a 3 jaw chuck. The correct mandrel and pilot drill for the material being drilled into. The necessary safety equipment. Safety goggles, gloves and hearing protection. For the best results and for safety reasons, use the recommended rotation speed for the material being drilled into. Use the correct mandrel for the diameter hole saw being used. 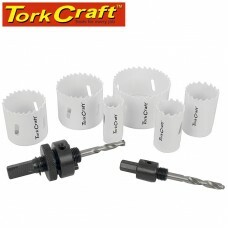 Use pin-type mandrels for hole saws larger than Ø32mm. When mounting the mandrel, lift the pins up and then screw the mandrel down into the hole saw as far as it will go. It is important that the pins holes are securely located in the hole saw. Use the correct rotation speed. If the speed is too high or too low will have an effect on the cutting edge on the hole saw and decrease the life expectancy. Clear away wood chips or iron filings frequently to prevent the hole saw from overheating. Always apply the necessary pressure for the intended use. Too much pressure can destroy the teeth when cutting in metals. Keep the drill going straight to avoid binding the hole saw. When using a hole saw for wood, clamp an off-cut backing board on the back to prevent tear out when the hole saw exits the material. The backing board also prevents materials from flexing. Tilting the drill or hitting a nail with the hole saw while drilling could cause the hole saw to bind. The powerful torque could strain your wrist.